I took that photo of our blind mare Lena this morning. She’s enjoying being turned out much more often than usual this time of year because we had so little snow over the winter. Lena was the very first disabled animal we ever took in — not only’the first horse, but the first animal. We had just moved to the ranch in Montana in the fall of 2000 and started the nonprofit, and while our initial plan had been to take in disabled dogs and cats, the arrival of the first blind horse led us down this?additional path. Yesterday was her 24th birthday! She?is now, all these years later, also the last of our blind horses. For the past few years we were down to just two horses, Cash and Lena. Sadly, we had to euthanize Cash over the Christmas holidays. Longtime blog readers may remember that we had taken him in as a blind foal way back in 2007, ended up training him for riding before we left Montana, and brought him with us to New Hampshire in 2010. (Incidentally, we haven’t taken in any horses since 2007.) But in the last?year?Cash had become increasingly difficult. We had long since separated Cash and Lena into different?corrals and pastures because he would pick on her and bully her, even though she had raised him since he arrived as a tiny foal. But his behavior grew more troublesome, with unpredictable outbursts that made him unreliable and hard to handle at times. 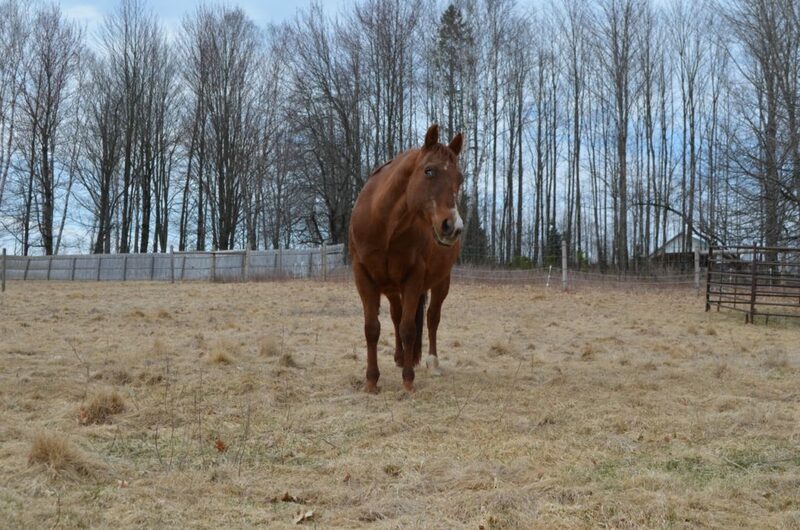 Last spring, he “blew up”?on us when our equine vet was here for spring vaccinations and health exams. A few months later, he exploded during a routine farrier visit. Fortunately he didn’t injure our farrier, but Cash’s?behavior left him?rattled and us no longer able to trust Cash. He was increasingly wound-up and anxious, kicking out, whirling, seemingly in constant motion. It became a challenge some days to walk him out to pasture, since we didn’t know how he was going to behave. We noticed that his anxious energy and antics were having an effect on Lena in the corral next door. She seemed nervous and uptight, which was?completely unlike her. The final straw came, ironically, on Christmas Day. We had an unusually warm and dry Christmas period, with?no snow on the ground, so we had been taking Cash and Lena out to?pasture on those beautiful days. ?I walked out to get Cash but he wouldn’t let me get him (this had been a recent development for him), so I?brought Lena?in first. I went back for Cash. At first he still wouldn’t let me catch him, but eventually I was able to walk up and stand next to him, ready to slide the halter over his head. Without warning, he shot up in the air, coming straight at me, front hooves out and flailing. I spun around and dove out of his way, and he just missed going right over me. I rolled away across the ground and underneath the fence. It was the closest call I’d ever had with a horse. Like our farrier had been, I was shaken but unhurt. I decided to give Cash some time to settle down, so I just kept talking to him, trying to coax him back to me, letting him know everything was alright. Cash was clearly agitated, but why I couldn’t tell. I walked away for a while, came back, and tried again. We went through the same pattern as before — he wouldn’t let me catch him, running around in circles, then eventually he calmed down, walked over to the fence, and stood there. I quietly walked up, talking to him as I went. Finally, standing next to him, I was just about to reach out with the halter when he exploded again, almost going right on top of?me. I fell over, hit the ground, but wasn’t trampled. I couldn’t believe it had just happened again. I thought about just leaving him out on pasture, but we had wintry weather (finally) coming in that evening. Worse, Cash would be too freaked out if we left him out on pasture by himself all night. He would end up taking out the fences and injuring himself in the process. Alayne was in the house while all this was going on, but I wasn’t about to ask her to try to get him. So I gave Cash some more time, and tried once again. I was, by this point, scared to death of this horse and what he might do. For whatever reason, this time he let me halter him without incident, though I could feel his manic, pent-up energy almost bursting through his skin. Nervous that he would erupt on me at any moment and holding the halter rope at arm’s length away from me, I carefully walked him down the hill and back to his shed. It was with an enormous sigh of relief that I finally took his halter off and turned him loose in his corral. I went into the house. Alayne took one look at me and said, “What happened? Are you okay?” I was white as a sheet, she said, looking like I’d just seen a ghost. I told her what had occurred with Cash?and how close I had come to serious injury. ?I said we had come to the end of the line with Cash. She agreed. We realized it had been a long time since either one of us had been?comfortable handling him. The following Monday, I called our equine vet to schedule his euthanasia. When she arrived, we discussed our previous conversations with her about Cash and his behavior, and she clearly remembered his blow-up the previous spring. Now, watching him circling and wound-up?in his corral, she decided for her own safety and ours to?use a four-foot-long pole-syringe to inject him through the fence with a sedative. Once sedated, I slipped a halter on him and walked him out to the grave site our contractor had dug for us earlier that day. The reason this was particularly upsetting for us is because we had to acknowledge’that of the four horses we had?who were born blind, we ended up euthanizing three of them for behavior problems. That’s right. First Destiny back in Montana, then Nikki a few years ago here in New Hampshire, and finally Cash. (The fourth one, Brynn, had been born with multiple physical?problems besides blindness — a hole in her heart, one kidney, and an ectopic ureter. We euthanized her for medical reasons.) These horses were from completely different lines, came to us from different parts of the country, and the only thing they had in common was the fact that they were born without vision. We had a very experienced vet in Montana who used to tell us that “disabilities like company,” meaning that if an animal is born with a disability, the chances are good that there may be another medical problem that could develop, or become apparent, later. In other words,?if a fundamental sense like vision is compromised during fetal development, there could well be other “wiring” that doesn’t get put together properly, too. Why would vision be the only thing that goes wrong, for instance? We had a case of a born-blind puppy in Montana who we adopted out to a wonderful lady we knew well, and about a year later, the dog developed mental health problems that created bizarre and potentially dangerous behavior that led to her euthanasia. We wondered then about this possible link. On the other hand, we’ve had many born-blind dogs over the years who never developed any other issues. They went on to live long, happy, wonderful lives. We’ll never know for sure what might have been at work when it came to these horses. All we have is our experience, and it’s disconcerting to say the least. Lena, meanwhile, is back to her usual calm?and?quiet self. Typically?horses are not happy to be without other equine company, but in Lena’s case, she seems perfectly content. Her own demeanor has noticeably improved’since Cash left. She’s herself again. When I went out this morning to take her photo, she was down in one corner of the pasture along a fence. I walked up next to her, slid my right arm underneath her jaw and brought my hand up alongside her right cheek, and walked her out across to the center of the pasture where I wanted to take her photo. In other words, I was using my arm as the “halter.” That’s the kind of horse she’d always been, but I couldn’t do that with in the past year or so. Now she’s as mellow as she used to be. And she sure doesn’t mind being pampered and doted on. I’m so sorry about Cash. It’s painful when an animal is in need but you can’t seem to do anything to help. I remember reading about him multiple times on your blog. And also glad that no one was hurt. It is puzzling that his behavior became so erratic.Hope Lena does fine and enjoys the attention. She seems to be saying “I’m ready for my closeup now, Steve” Now that we’re up to date on the horse situation, how about an update on the goats and maremmas? Would Lena like a kitty companion? I know at the horse race tracks, they keep barn cats there in the stall to keep horses calm and happy. One thing I have learned about you all over the years is that you never euthanize an animal without cause. I know it was sad when you had to do that to each of these horses. Thank you for sharing the story. I’m glad to see Lena is doing so well. You mentioned you had not taken in a blind horse since 2007- do you think you might take in others (I may have missed a post explaining this in the past) at some point, or are you focusing the the dogs and other aspects of the Farm for now? Thank you for this update, although it must have been difficult for you. I believe that all of us who have followed Rolling Dog for many years like to hear about the animals we’ve heard so much about. Good news or bad news. How heartbreaking for you. And here I thought you had had a calm and emergency-free Christmas for once. Poor Cash. That link between being born blind and later mental illness, specifically in horses, is very interesting (and tragic). It’s so difficult dealing with an animal that develops bizarre behavior which is clearly caused by some kind of brain issue (rather than by physical pain, fear, etc.). I’ve dealt with it in a small dog, which was bad enough, but I can’t imagine dealing with it in a huge, lethally-powerful animal. I’m glad you came out of it OK, and very sorry you (and Cash) had to go through it. Glad Lena is feeling better now though. Although this is sad, for some reason it feels good having an update like this. I’ve missed your posts that shared situations like this but understand the negative feedback you’d sometimes get from keyboard warrior know it alls. I often think of many of the old timers and wonder if they’re still around. Like Spinner. Anyway, it’s good to see Lena and isn’t it interesting that she was the first and now the last. And I’m so grateful you weren’t injured Steve!!! I’m so sorry to read about Nikki and Cash. I remember meeting Nikki and Lena back on a visit to Rolling Dog Ranch in Orvando and reading about Nikki and Cash being ridden for the first time. I’m so sorry for you both. It is nice to see Lena again. You provided Cash with a lifetime of happiness that he would unlikely have experienced anywhere else. I remember well all the old stories about Cash as a precocious and testing young foal feeling his oats and later learning how to accept a rider. Thank you for giving him such joy while he was able to experience it. I’m sorry for your loss and glad you weren’t hurt. Happy that Lena is back to her old self. She is a beautiful girl and deserves to be treated like a princess. Sorry to hear about Cash. I know you had no choice. I introduced you to my blind appy Socks back around 2005. In researching his blindness, I found your blindhorses.org and that’s what kept he and I together. He was always a character and mischievous but never mean. I loved him so much and have you to thank for my keeping him after he lost his eyesight. Unfortunately I lost him to colic four years ago but we had eight great years together. I still have my other appy Duke who is healthy and in his early thirties. I hope you’ll have Lena just as long and I’m so glad she’s happy. I’m sorry you’re not taking anymore blind horses but I can understand why. You guys are the best. Thank you, Stu, we appreciate it. As all the others, I am heartbroken for you. It is good to see Lena enjoying herself. God’s blessings on you. Your sacrifices are beyond words. So sorry to hear about the situation with Cash. I know a year ago my blind horse, Saber, no longer really wanted the Vet to give him shots, so those days are over with. He is content in his “known” surroundings and hopefully he remains happy and healthy for a long time. I look at Lena’s picture and see that cocked head blind horses have as they listen to their environment. That brings comfort as well. As someone else mentioned, your website for blind horses is how I also came to be here reading your blogs. You helped me, and I am sure others, realize that these blind big animals can still be a blessing to our souls, no matter their loss of sight. God Bless. I always wondered what happened to Cash. Thank-you for updating everyone on him, as hard as it might have been. Anyone who’s been with Rolling Dog since Cash came will know just how much you both loved him! I’ve worked with horses for over 10 years, and I don’t blame you for having him euthanised. There was just no other option. He was a danger to you, and to himself. With a sighted horse with behavioural issues, there are always explanations, and always ways to help. With a blind horse with behavioural issues, there’s just not many options. I’m glad you had a few peaceful years with him, and gave him all the love he could ever need. If he hadn’t ended up with you, he might not have had any years at all. HAPPY BELATED BIRTHDAY LENA! YOU LOOK GREAT FOR YOUR AGE. GLAD YOU ARE HAVING MORE STRESS FREE DAYS NOW. THANK YOU STEVE FOR THE UPDATE. I’M SURE IT WASN’T AN EASY DECISION ABOUT CASH, BUT HE HAD THE BEST LIFE POSSIBLE WITH YOU. Steve, thank you for trusting your followers enough to tell this difficult story. It is never easy to make the decision to euthanize an animal. I have had to be part of the decision on two horses in recent years, and I’m always so grateful when they give me a clear sign that they are ready to go, and there is no doubt of our decision. Country and Missy were 32.5 and 29, and we kind of expected it. There is no doubt Cash gave you a clear sign he was miserable, angry and in his primitive way, he was telling you he wanted relief. He was done. You are both kind souls, and you did the right thing. Thank goodness you were there for him, and now Lena is there for you. Sweet beast that she is!